the body of work by washington DC-based artist jim sanborn is saturated with archeological, mathematical and scientific exploration through sculpture and photography. sanborn aims to highlight normally unseen aspects of existent concepts or objects such as the coriolis effect, the earth’s magnetic field or cryptography. his work is especially appreciated by the world’s scientific community– the artist has created pieces for massachusetts institute of technology, the central intelligence agency, the national oceanic and atmospheric administration in addition to many art-specific spaces. sanborn, developed the ‘topographic projections and implied geometries’ series in the late 1990’s. each image was produced by the use of a large format light projection system aimed at each earthen sculpture from a half mile away. 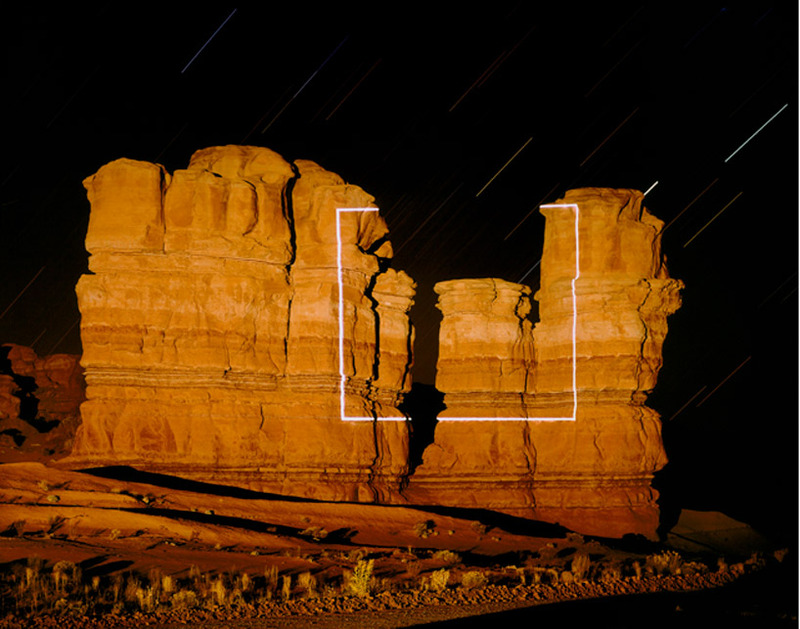 the light projections, orchestrated by sanborn, were powered by generator which was transported by the artist in order to continuously produce the light shape for an extended period of time, then captured in the long exposure photographs. in this way, sanborn is able to seemingly superimpose mathematical shapes onto the rock formations of the american south west and the jagged coastline of ireland.